Written By: Patricia B. Mcconnell, Ph.D. The critically acclaimed author of 'The Other End of the Leash' offers fascinating insights into the canine mind-critical tools for a healthy relationship with a well-trained dog. 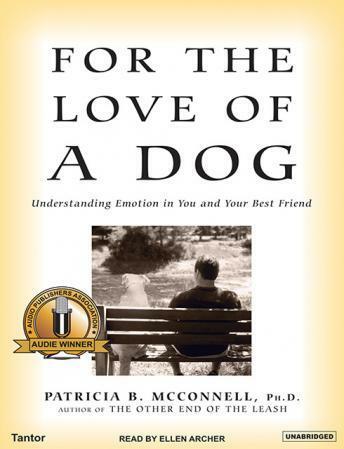 In this remarkable book, renowned canine expert Patricia McConnell answers the questions of dog lovers everywhere. Do dogs have emotions like we do? More to the point, does my dog love me? Such questions have fueled bestsellers like Elizabeth Marshall Thomas' The Hidden Life of Dogs and Jeffery Moussaieff Masson's Dogs Never Lie About Love. Sharing riveting dog stories from her experiences, Dr. McConnell also offers accessible science that clues readers in to what's going on behind those puppy dog eyes. We learn the fascinating similarities and surprising dissimilarities in dogs' and humans' brains, and how current scientific studies have led McConnell to conclude without a doubt that dogs share a profound emotional life with us. The information found in this book will help readers have better-trained dogs, at the same time deepening their dog-human connections. For the Love of a Dog is a must-have for dog lovers everywhere. Listening to the entire book is a labor of love. As a fan of animal books, I kept going. There are some useful tidbits and anecdotes here, but a kind and careful editor could have transformed this from an average book about dog training and psychology, to a home run. Instead, For the Love of a Dog often runs amok with redundancy like an undisciplined sheep dog--something the author would never allow in her animals, but apparently tolerates in her own writing. I found this book exceedingly tedious and barely was able to listen to the whole thing. I am an animal lover, but didn't find these stories to be helpful or interesting or original. This was fairly redundant and boring. Many of the stories that were interesting were shamelessly pulled directly from "Blink" by Malcolm Gladstone. Gladstone did a better job of relating the information as well. What didn't come from "Blink" was self serving stories about her own experiences with her farm animals. It was OK but I definitely wouldn't recommend it to a friend. This is definitely in my top 10 audiobook favorites, and 7 of those slots go to the Harry Potter books. Full of information, For the Love of a Dog gives a in-depth look into the mind of our canine companions, explaining thoughts and emotions. This book is definitely for those who love their dog, consider them family, and want to understand their behavior more clearly. I also loved it so much that I have ordered the hardcopy. I also intend to read the author's other books. Definitely for the science-minded reader, but I recommend it enthusiastically. The reading was excellent as well. Having been absolutely enthralled by "Marley and Me" and "It's okay if you miss the bed on the first jump", I was prepared to thoroughly enjoy this book as well, but I didn't. O'Connell is VERY cerebral, discoursing at great length on brain physiology. I also felt that she was condescending to dog owners, stating repeatedly how they misinterpreted their pet's emotions. This book is only for the most avid student of canine behavior. I loved this book so much I bought the hardcover. Dr. McConnell has great insights into the similarities--and differences--in the brains of humans and dogs. She uses many stories to illustrate her points. It's science but it's not difficult to understand. The emotions of fear, anger and happiness are more obvious to me in my own dogs now that I've heard Dr. McConnell describe the cues.